Davide Cabassi — Laguna Beach Live! 2005 Cliburn Competition finalist Davide Cabassi made his orchestral debut at the age of thirteen with the RAI Symphony Orchestra in Milan. 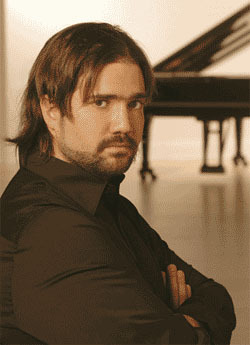 He has since performed in Austria, China, France, Germany, Japan, Portugal, Russia, Scandinavia, and Switzerland, highlighted by appearances in Salzburg’s Mozarteum, the Gasteig in Munich, and Rachmaninoff Hall in Moscow. “Cabassi entered the stage with the ease and pleasure of stepping into a warm bath. He luxuriated in the joy of creating a coloristic sound world that produced an unconventional Bach, a ravishing Debussy Estampes, and a riveting Petroushka.” John Winter – American Record Guide In 2006, Mr. Cabassi was selected by the Association of Performing Arts Managers (APAP) to showcase at its annual conference in New York attracting over 4000 industry professionals. During the 2006-2007 concert season he will make his debut with the Amarillo and Hartford Symphony Orchestras, and he will tour with the Manchester Music Festival orchestra in the northeast. He has also been engaged for recitals and educational programs by Purdue University; the University of Wyoming in Laramie; the Portland Piano International Festival in Oregon; and the Louvre Museum series in Paris.